The Sigillo Rosso is a rich and full flavoured balsamic in which a sweet, fruity perfume recalls the grape must, united to create a delicate citrus note. 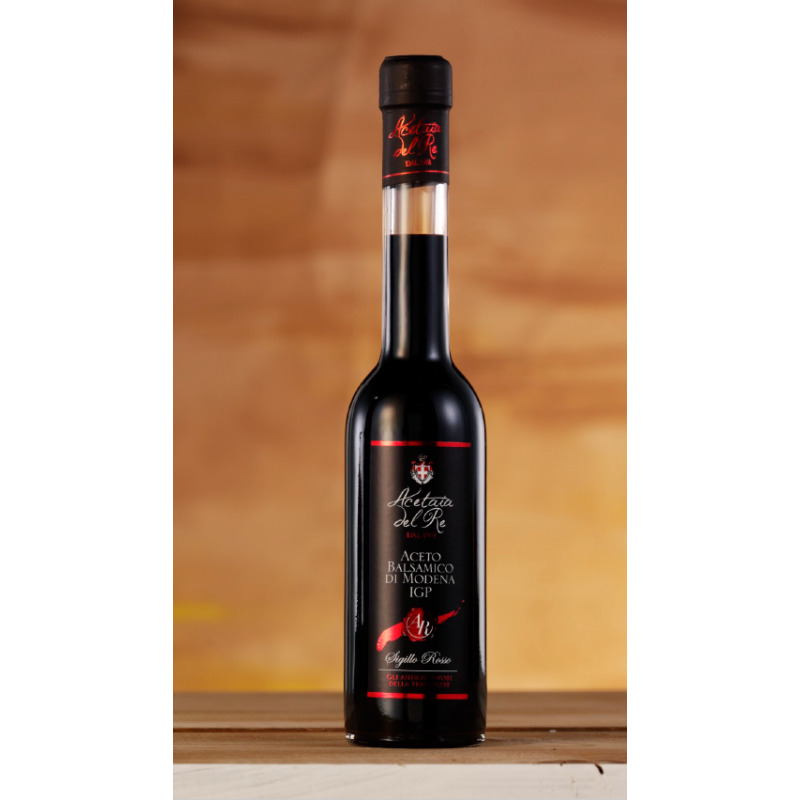 The long ageing, in large barrels, round the flavour and give this balsamic a full and balanced taste. Chef’s suggestions. Roasted and grilled meats, chicken breasts and other white meats, raw and steamed vegetables, goat and other delicate cheeses and, at the end of the cooking process, to be added to sauces and gravies. Must of cooked grape, aged wine vinegar. Ideally located in the heart of Provence, Plantin is today the world's most recognized truffle brand. From michelin-starred chefs to fine connoisseurs, their truffles are well known for their constant quality due to a precises and expert sorting, their wonderful flavor and delicious aromas. Plantin was founded in 1930 by Herve Plantin before the Poron family took over in 1986. Today, Christopher Poron carries on the Plantin expertise, following the Poron family's tradition and sharing his passion for truffles and culinary craft all over the world. The company was founded more than 40 years ago by Raphael Bouchez along with his friend and mentor, Jacques Nebot, one of the world's most respected caviar expert. Today, along with Jacques' children - Karin and Laurent - , they keep sharing their passion for caviar, family traditions and culinary craft. Since the second Empire, the butcher profession has been passing from father to son for 7 generations within the Bissonet family. Today they run 4 Boucherie Nivernaises shops, including their magnificient flagship store in Faubourg Saint-Honore street. They also provides Michelin-starred restaurants and Parisian luxury hotels, but they biggest pride is to be the purveyor of the Élysée palace (official residence of the French president) for more than 50 years. The Polmard butcher shop is run by Alexandre Polmard, a sixth-generation butcher whose lineage is famous for their quality meat offerings since 1846. The business truly distinguished itself in the 1990s when the family introduced a unique meat treatment called “hibernation”, and which revolutionized the process of “aging” beef. The complex method—believed to retain the flavor, texture, and quality of the beef—begins with the company’s Blonde d’Aquitaine cattle (one of the most popular beef breeds in France), which are raised free-range on the Polmard family’s farm in Saint-Mihiel, France. Once butchered, the cuts of beef are dry aged then prepared for hibernation at the property’s on-site laboratory, where cold air is blown onto the meat at 120km/h in a -43 C setting. Unlike freezing, this allows meat to be kept for a purportedly indefinite amount of time with absolutely no loss of taste or tenderness. The resulting beef has captured the taste buds and attention of renowned chefs across the globe, a select few of whom exclusively feature the beef on their menus, such as Chef Fabrice Vulin former Chef of Caprice restaurant at the Four Seasons Hotel, Hong Kong. unique, delicate flesh, has become one of the most renowned poultry used in French “Haute Cuisine”. With more than 100 years of experience, SAVIC Challans Red Label breeders are THE true specialists! Based in the Vendee, a well-known farming region for poultry-breeders, more than half of them are in the Challans area alone. The mild climate of Vendee and the slightly acid soil offers plenty of lush, tender grass with a light touch of sea flavour: a true paradise for poultry! On top of that, their free-range poultry has a 100% natural plant diet with 75% of cereals minimum. The Red Label certification body, backed up by an independent certification Body, guarantees several audits. It is a sign of quality assurance in France. According to the French Ministry of Agriculture: "The Red Label certifies that a product has a specific set of characteristics establishing a superior level to that of a similar current product". 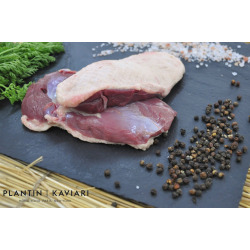 The House of Castaing is a French family business, founded in 1925 in the Landes, a region where geese and ducks are known as the most qualitative on the market, thanks to its exceptional natural environment. Inherited know-how, quality exigence (Label Rouge certification) and craftsmanship make the House of Castaing a genuine ambassador of French cuisine. The cheesemonger Xavier Bourgon has launched his own brand 30 years ago. Since then, his son Francois Bourgon has taking up the running. He received in 2011 the title of ‘’Meilleur Ouvrier de France’’ (shortened MOF, meaning Best Craftsman of France), which is a unique and prestigious award in France. The contest is held every 4 years and is organized and recognized by the French Ministry of Labor. Created in Paris in 1987, Palais des Thés is a French brand of premium tea. Its dedicated team of passionate tea experts has been touring the world for more than 25 years, to find rare crops by looking outside the traditional supplier circuit, and to share with tea lovers the harvests of small plantations, which are often hidden away. By visiting and controlling tea estates regularly, Palais des Thes builds long-lasting relationships with its suppliers and guarantees teas quality, while being involved in environmental issues, working conditions on the estates and the fair trade practices. Born from a family of farmers, Alain Milliat created and operated for fifteen years an orchard of fruit trees in Orliénas (near Lyon). He specializes in the production of cherries with zero defects for its customers in Paris. Then he developed in 1998 several fruit nectars, the Nectar of peach, immediately adopted by the sommeliers of Relais et Châteaux. Today, Alain Milliat is one of the world's top producer of high quality juices, nectars and jams. His products that are characterized by authentic and natural flavors, are present in gastronomic restaurants, luxurious hotels and specialized shops. Alain Milliat chooses carefully the production areas and works hand in hand with farmers from all over France. His philosophy is to respect the fruits’ nature and their variations in order to provide the pleasure and taste of fresh fruits at the peak of their maturity. His know how of the optimal harvest time combined with the most simple techniques are the keys of his products’ uniqueness. ''There is no good ham without good pigs'', this was the motto of Louis Ospital, a humble artisan from the Basque Country region in France, who opened his first deli meats store in 1971. His exceptional cured meats come from an agreement with 2 pig farmers to breed their animals with an OGM free, antibiotic-free and cereals based wholesome nutrition, for 12 months minumum until they weigh at least 180kg. Then these hams are salted, equalised and put through a series of drying stages and aged for between 15 and 20 months. Since late 2000, his son, Eric Ospital, took the helm of the family business, and despite the opportunity of increasing massively their production, he decided to favor a qualitative production. Indeed, after earning the trust of many chefs, such as Yves Camdeborde who brought his products in Fauchon outlets, Eric Ospital faced huge demand coming from NY to Tokyo, but he politely declined all the sollicitations in order not to forego the high quality requirements of their Ibaiama pork, which built their reputation. Thus, we are very proud at Plantin Kaviari to be able to purvey their range of products with exclusive distribution. Native of Southern West of France, Alexis has a real passion for olive oil since his childhood. Graduated taster of the Spanish International Olive Oil Council, approved school in 2010, Alexis is a real expert in olive oil. He has forged his expertise with the farmers and the millers which helped him to build his adventure but also with the chefs he meets daily. For Alexis, olive oil is not a condiment but an ingredient of exception. His philosophy is to apply the very simple process of extraction to keep the most authentic taste. Throughout a quality environment, a variety of olives with strong personality and an efficient structure, Alexis Muñoz brings its expertise to create an excellent raw material, mono-variety produced in small quantities. Since the creation of the brand in 2012, a hundred of starred chefs in France and abroad, are using the Alexis Muñoz olives oil crus.